Does the G19 version of this fit the P10C? Amazon was blowing out a Hogue ARS Stage 1 for P10 and it works great - also fits the F perfectly. Even at regular price - $50 - it's a good Level 1 Retention holster for anyone OCing or carrying the P10 for work. The G19 version of the Blackhawk Serpa does NOT fit the P10c, but the H&K USP9 version fits it well. Really love this “ghost” holster by www.veilsolutions.com with an Ulticlip XL. Most comfortable holster I’ve tried yet. Just got this Dara drop holster in the mail. Seems to be great quality and fits the pistol perfectly. Also just received an Axis from Tier 1 Concealment. Super high quality holster. 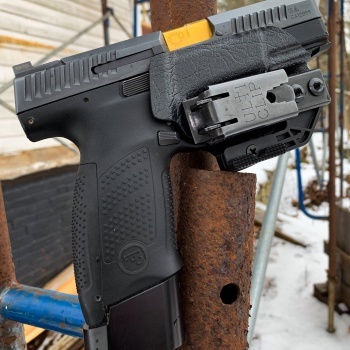 I called Safariland yesterday (03/29/19) and asked about an ALS holster for either my P-10F or P-10C I have that are both milled for red dot sights, and whether their Glock holsters fit the P-10 platform. The Safariland rep said somebody started putting out bad info about the P-10 guns fitting Glock holsters. They will only go in 2" and that's it. 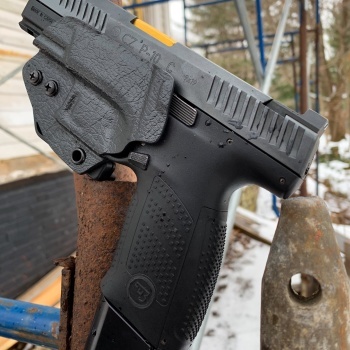 As for their ALS holsters for any of the P-10 S,C or F variations, they need requests for 5,000 orders before they will build a mold for one that costs $75,000.00 each. Hopefully as more P-10's hit the market and demand goes up Safariland will build what we want and need.